Dan Looney and Adam Paulden’s touring production of The Wedding Singer took to the floor for its first dance at the Churchill Theatre on Tuesday night, and trust me when I say this eighties pop hit is the matrimonial event that you don’t want to miss. Based on the film starring Adam Sandler and Drew Barrymore, The Wedding Singer tells the story of performer Robbie Hart who hits rock bottom when left at the altar by his fiancée. He goes from wedding champion to love casualty but is saved from his downward spiral by waitress Julia. Engaged to notorious city trader, and cheater, Glen Gulia, will she realise what true love is before it’s too late? With weddings at its heart, this show is always going to be a tad cheesy, but this production rises above that, balancing the light-hearted fun with emotional pull. Jon Robyns, as Robbie, leads with this spirit, with strong vocals and an effortless capability to win the audience over and bring them on his character’s journey. The bubbly eighties soundtrack is perfect for the show and is brilliantly punctuated by a strong book; witty and funny when it needs to be without taxing an audience who want an easy night at the theatre. Choreographically this production is more ambitious than I anticipated and it really works with this energetic ensemble who truly bring the show to life. Ray Quinn, as Glen, once again proves he’s no forgotten X Factor star trying his hand at the touring scene. He is a confident musical performer, vocally and physically who really relishes this role. Our leading lady, Cassie Compton (as Julia), is cute and nicely portrays the girl with the white wedding dream, however seems to separate and force some notes which can be a little distracting. You’re spoilt with talent among the other supporting roles but special mentions must go to George (Samuel Holmes) and rapping Nan Rosie (Ruth Madoc). Technically, despite a few minor hiccups, the show is strong. The lighting is particularly clever and compliments the set and staging. The varying scene locations were handed well and the bar where the guys sing ‘Single’ is an understated stroke of genius, especially when coupled with Nick Winston’s ‘bottom half’ choreography. It’s rare you find a touring production that so capably offers light entertainment with such sentimental heart. The Wedding Singer is charming, lively and above all uplifting. This is definitely a show to fall in love with! 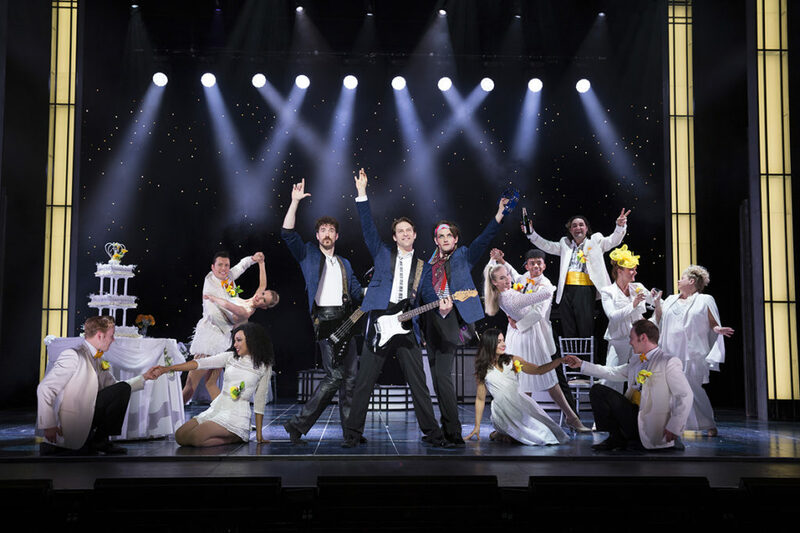 You can catch The Wedding Singer at The Churchill Theatre, Bromley until Saturday 5th August before it continues its UK tour. Full touring details here with Bromley tickets on sale here.